Chairman Stewart Gilmour expects to have St Mirren's managerial situation resolved in the next ten days. 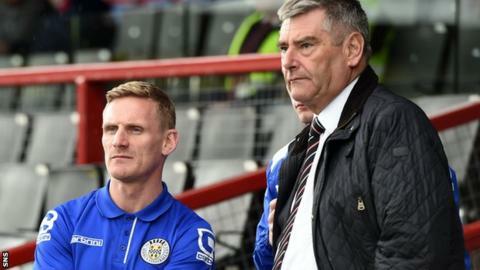 Already relegated Buddies say they have received a "number of applications" for the post, but Gilmour insists incumbent Gary Teale is still being considered. "We've got a pretty important seven-to-ten-days ahead of us," Gilmour told BBC Scotland before Saturday's meeting with Motherwell. "We've got to look at all these this week and move the club forward." Teale was appointed caretaker manager in December following the dismissal of Tommy Craig, but could not keep the side in the Scottish Premiership. The former Scotland international said he has not applied for the job, feeling the board should already be aware of his attributes. "We're looking to see what's out there, then we'll look at what Gary's done and try and do a comparison," Gilmour told BBC Scotland. "Gary's well aware of the situation we're in, but it would be wrong not to look out there and see who's interested in taking the job. "The one bright thing is the kids have all done well, let's hope we can take that into next season, that's what Hearts have done. "[The new manager will] have to be good with youth. We're producing a lot of kids who are doing well in that age group. [The youth team] had a wonderful result during the week against Celtic with a lot of under-17s in the team. "We've got to get them to the next stage, get them to become men, so that's an aspect we would look for in a new manager." Gilmour said the club will go into the Scottish Championship with the intention of being promoted within one season, despite the presence of one or both of Hibernian and Rangers. "We've had to make some cuts, we've tried to make the season tickets attractive by encouraging youth in particular," the chairman added. "The finances in Scottish football have come closer together with the amalgamation [of league bodies to form one], it's not quite the dramatic drop that it was previously."